"The Peche Island Rear Range Light was built of cast iron in 1908 to mark the narrow passage from Lake St. Clair to the Detroit River and guarded the reef for some 75 years. It was never manned. In 1926 the height was raised to 66 feet (20 m) and with that additional height the tower protected the passage until September 23, 1983, when it was scheduled for decommission and destruction. 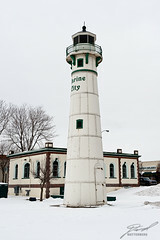 Learning of the plan to demolish the tower, a rescue effort was begun by Marine City, Michigan to relocate it to a site in the city's Waterworks Park. The tower's weight is 35 tons and with the height of 66 feet (20 m) and a diameter of 14 feet (4.3 m) the move took ingenuity and perseverance, but was finally successful."